Have you seen that movie? It's pretty old, from the 90's. It's been on my mind this morning. The gist of the movie, at least as I remember it, is a young and confused 20's something girl finds herself after she spends a summer with strong women who are making a quilt. Life stories are told, lessons are learned, and in the end the quilt is finished and you realize just how much connection there is between all these amazing women and the events that make up their lives. The quilt, which ends up being a story of their lives, is truly made of love. It kind of sums up what I'm feeling today. I have a quilt like that. This quilt was made by several women over the course of many, many years. My Great grandmother and my grandma, Nana, were strong, capable women who were resourceful and wise. These two women, and sometimes my mom, used to make a lot of their own clothes. My Nana used to always make pajamas for her four daughters and sometimes for my older siblings. And, without fail, polka dots were almost always the fabric design of choice. All three of these women loved polka dots! Because these women were resourceful, they'd save their fabric scraps. My mom took those scraps and started making this puppy dog quilt. 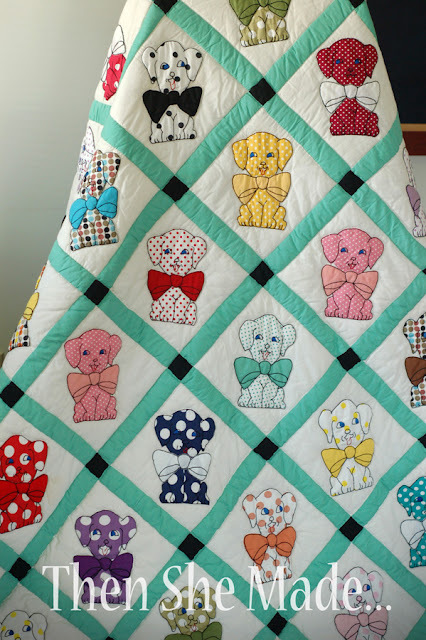 She hand cut and then hand sewed all those dogs and bows onto each square and then pieced the squares together to make the top of the quilt. That is as far as she got. She died at a young age of 43 and never was able to finish it. The quilt top was passed to me which, being only 9 when she died, I had no clue of it's importance or what to do with it so I kept it in my toy chest which I had converted into a hope chest for that "someday". Years later, when I was 19 and about to get married - yes, I married young - my stepmom, another strong and capable woman, took that quilt top and finished the quilt for me. She picked out the back fabric, it's green polka dots, did all the quilting and then paid to have it bound. This quilt is one of my greatest possessions. It has the love of my great-grandma, my grandma, my mom and my stepmom in it. I've realized that we don't craft like that anymore. At least I don't, my creations, while cute and clever, they aren't long term works of the heart. They are disposable. for the most part I'm ok with that but I've realized I want to pass on a few things to my girls that sum up who I am. Maybe I should make a quilt! What a legacy of love! What a great heirloom to pass on to your children ... all that family history all in one cozy quilt. Oh, and I'm checking Netflix for the movie right now! I love that movie! It's one that I would love to own. Your quilt is so beautiful. What a great memory quilt to have. And you SHOULD make a quilt. It is such fun to put together the many different fabrics into a top. I love to quilt and I love your story! This is gorgeous never find one in store or anywhere as pretty.But don't you have 2 girls? you will have make another or their will be rumble over this..lol,hope not but honestly I would put up one with my sister for it ha,ha, shhhh!!!! I have started to make a quilt for my daughter and son- in-law's 10 th wedding anniversary. I am doing it more for my satisfaction than theirs in the hope that one day they will understand the love that went into it. Found this quilt on pinterest. What a beautiful quilt and an even more beautiful story! Love the polka dots!